The TARDIS lands in a forbidding castle in a time of religious upheaval. The old god has been overthrown, and all heretics are to be slaughtered. Obviously it isn’t the sort of thing which would happen there every day – just every few years or so. And when the Doctor and Frobisher are hailed as messengers from heaven, they quickly become vital to opposing factions in their struggle for power. But will they be merely the acolytes of the new order – or will they be made gods themselves? An evil destructive force is growing deep within the crypt. And the pair soon find out that they will be lucky to escape their new immortality with their lives. 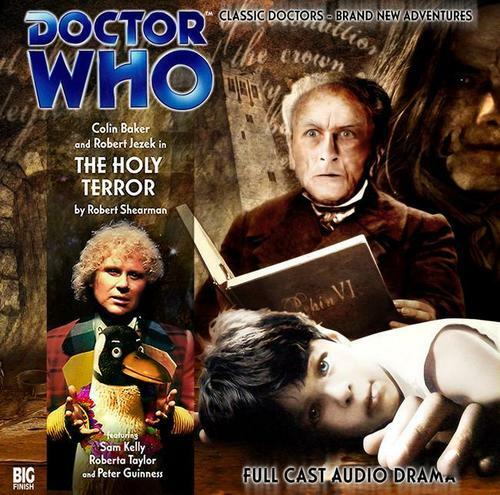 Colin Baker is the Doctor in…The Holy Terror. I don’t even know where to START with this story. When I first read the plot on the Big Finish website, I thought “wow, even for Doctor Who this is flipping out there, and I’ve seen The Happiness Patrol.” But being the completist that I am (I do own a CD copy of Minuet in Hell after all), I picked it up. When the story was all said and done, I took off my headphones and silently looked out the window for a few minutes, because I had just listened to an audio tour de force. Yes, that’s Colin Baker holding a penguin on the cover of the CD. Yes, that penguins is the companion for this story. Yes, the companion talks. Yes, it’s just as weird as it sounds. But when you throw in a great voice behind that penguin, add Colin Baker with a powerhouse performance, a supporting cast that’s playing stereotypes on purpose, cracking dialogue that swaps between funny and terrifying, and a story that goes from “brilliant farce” to “hide behind the couch terror,” you have what no less than Steven Moffat calls his favorite Sixth Doctor story. The TARDIS has had enough. Frobisher is using the holographic circuits to hunt and catch replicas of fish and the Doctor has neglected her maintenance for far too long. She goes on strike until the Doctor agrees to let her fly to whatever point in space and time she wishes. And her choice is a castle where a new god-king is being crowned. The old king wasn’t a god, after all. He committed blasphemy by dying. As the new god-king worries about whether or not he IS a god, all those who believed in the old god are sentenced to death for heresy…unless, of course, they just sign these convenient recantation forms, as they always have when a king dies. And all it takes is a simple miracle to prove divinity (“Now, sire, pick a card, don’t tell me what it is, put it back into the deck…”). While the new king “summons” a blue temple for his subjects to worship him, his crippled, hunchbacked brother plots to overthrow him (as always), with the assistance of the High Priest (as always), and the new Empress plans the torture and execution of the old Empress (as always), while (as always), the scribe records it all in the “new and improved Bible.” The arrival of the Doctor and Frobisher throw everything into chaos, as the new king decides that, in the face of tradition (and the constitution), FROBISHER is the new god! Of course, this just means that the brother’s scheme must be accelerated. Two miles under the castle, his plan awaits…and it will cause more chaos than the Doctor’s arrival. There’s the canon of the television series, the “official” canon. Then, you have the Big Finish canon, which is well fleshed out, but is forbidden to be mentioned in the television series (and vice versa, Big Finish can’t touch the Time War and its aftermath). Then, you have the New Adventures canon, the series of novels written after the series went off the air. Sadly, the best way to describe these books is “Ace becomes a Space Marine that shags anything that moves.” Then, on top of THAT, you have the comics, where the strips run inside Doctor Who Magazine every month. 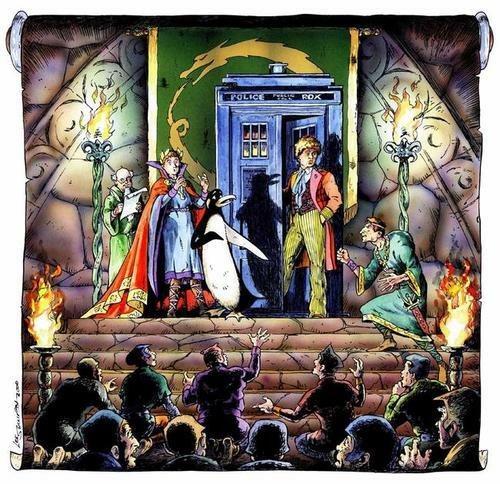 That is where we find Frobisher, a shapeshifting (“Mesomorph!”) private eye who joined the Doctor on his adventures. Normally a short, yellow humanoid alien, Frobisher prefers the form of a penguin. This is the first of two audio adventures Frobisher stars in, the other being the special release The Maltese Penguin. Robert Jezek is the voice of Frobisher, and he has JUST the right accent in his portrayal. Frobisher sounds like the stereotypical 1930’s gumshoe without the over the top American accents from Minuet in Hell. In words I never thought I’d write, from the beginning of the play, I bought his portrayal as a talking penguin. When he becomes the god of the castle, he immediately tries, in true companion form, to do good, such as changing the shape of his beak when a sculptor is to be put to death because they got his new statue wrong. When it all goes to hell, he still tries to do good, but is quickly overwhelmed. Jezek hits all the right notes in grand fashion, mixing humor and drama and terror in a perfect pitch, and really brings the character to life on the audio side of things. Once again, Colin Baker makes me want to go slap the gentleman who was BBC Controller at the time of his TV run. While this serial probably could never have been properly done on television, Baker’s performance is one of his best in any medium, and I say this before listening to what some consider the best Big Finish audio, Jubilee. His chemistry with Frobisher is incredible, setting the tone of friends who gently chide one another within seconds of their initial lines. It’s like they had acted together before, which is a testament to the acting skills of Baker and Jezek. Baker’s confusion and analysis of the rituals of the castle is likewise spot-on, and when he realizes what is going on, the usual Sixth Doctor traits of bombast and superiority quickly turn into terror and fear. As opposed to McCoy’s acceptance and morose nature in The Fires of Vulcan, Six is panicky and flat-out afraid come the fourth episode. Seeing pure panic in the Doctor is very jolting, and Baker acts the hell out of that fear. His begging that “there is another way” during the climax is just…wow. Hearing the Doctor figure things out and realizing just how screwed they are is something that the new series hasn’t pulled off very often. Now, the supporting cast is…they’re playing stereotypes straight out of a Shakespearan royal tragedy. And, for the purposes of the story, that’s exactly what they need to be playing. Stefen Atkinson is the new king who’s very unsure of himself, Helen Punt is his power-hungry queen who despises his weakness, Roberta Taylor is the former Empress who wants to be put to death as the rituals demand, Peter Guinness is the twisted brother who plots for the throne, Peter Sowerbutss is the High Priest Clovis who performs the necessary miracles before attempting to overthrow the new god, and Sam Kelly NAILS a dual role as the royal scribe AND the final villain of the piece. I don’t want to give anything away, but his performance as The Boy is one that will stick with you. “Are you my Father?” is the Big Finish counterpart to “Are you my Mommy?” His part in the final climax is horrific and powerful. As for the others, in the third act, when they STOP playing stereotypes, it quickly becomes part of the haunting nature of the story, and two very simple question are asked. Doctor Who rarely touched upon religion during its television run. Planet of Fire and The Daemons are the only ones I can think of off the top of my head…and no, I’m not counting Tinkerbell Jesus Doctor at the end of Last of the Time Lords. The Holy Terror dives right in with a great script by Robert Shearman (aka the guy who wrote The Chimes of Midnight for Big Finish and Dalek for Nine’s run) that touches upon the sometimes hypocrisy of religion (they shoot the new god to prove he’s a god, but since he IS a god, they use blanks anyway) and many of the long and bizarre rituals that, even as a devout Christian, I found myself going “well…yeah.” Baker has a great line that I’m flat-out stealing – “Religions are all the same. The fundamentalists die out, the edges get sanded, and you’re left with someone that’s simply warm and fuzzy.” It’s not insulting, it’s thought provoking. The script itself…oh, boy. It’s funny, it’s witty, it’s provoking, it’s challenging, and at the end, it’s horrifying. The cliffhangers themselves deserve mention, a mix of suspense (“To death, or life eternal!” *gunshot*), humor (“All hail Frobisher! All hail the big talking bird!”), and horror (“Who is the man who created GOD?”). Shearman switches from humor to drama at the drop of hat and we’re brought right along with him. The climax and the denouement see the Doctor at his most pleading and at his most resigned. I was reminder of Five at the end of Warriors of the Deep with the final conversation between Frobisher and the Doctor. The serial itself it longer than normal (it felt like it could have been a five-parter or even a six-parter), but the pacing was great and it never dragged, not once. Final Synopsis – It’s funny, it’s scary, it makes you think, and it has a talking penguin. Three out of four of those are classic Doctor Who. 5/5. Next up – Germany, 1589: the townspeople of Cologne pronounce a sentence of death on a mass-murderer who has stalked the countryside in the guise of a ferocious wolf. Russia, 1812: retreating from Napoleon’s invading forces, a merchant’s daughter is rescued from bandits by a handsome partisan with a ravenous appetite. Peter Davison as the Doctor in…Loups-Garoux. This entry was posted in Big Finish Review and tagged Big Finish, Colin Baker, Doctor Who, Frobisher, Sixth Doctor, TARDIS. Bookmark the permalink.